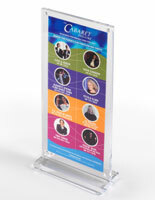 This stand up picture frame is used to hold photographs, signs, brochures, food specials, sale information, and other advertising materials. 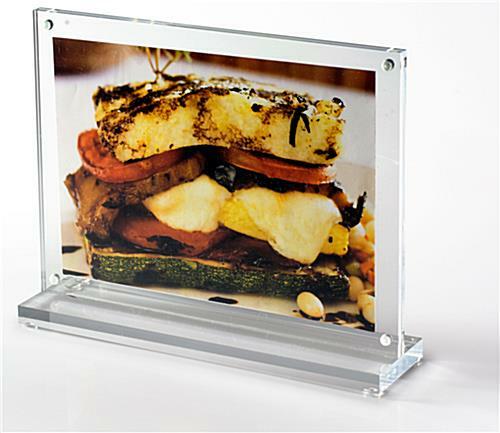 Each photo holder may be used in home environments, restaurants, bars, retail settings, tradeshows, and other various locations. 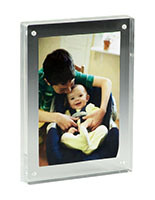 This 7x5 stand up picture frame is ideal for displaying family photos from kitchen tables or presenting drink specials on a restaurant bar. 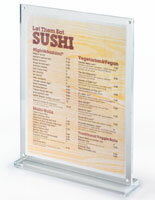 This sign enclosure can be used in a variety of locations for a wide range of photos and signs. 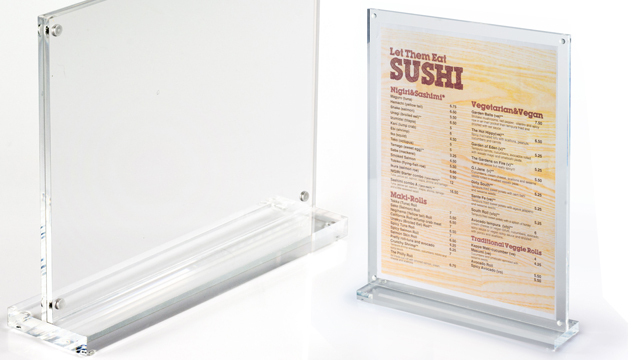 This stand up picture frame that holds menus is made of see-through acrylic. This composition adds to the versatility of this fixture. 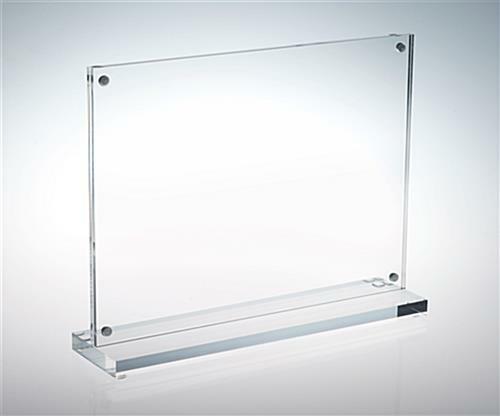 Each stand up picture frame that is clear acrylic is easy visible to customers due to its upright resting position. This easy viewability is helpful to businesses that wish to promote certain items or information. 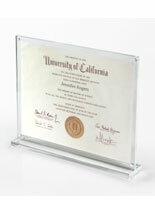 This acrylic stand up picture frame is designed in a t-shape with a rectangular base. This bottom base allows the unit to sit in a vertical position. 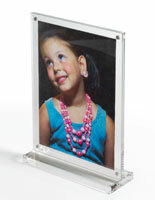 Each stand up picture frame that is 7” x 5” features two acrylic panels that are held together with magnets. To put a photograph or sign inside of the fixture, one must simply pull apart the two clear sides and place the image within. 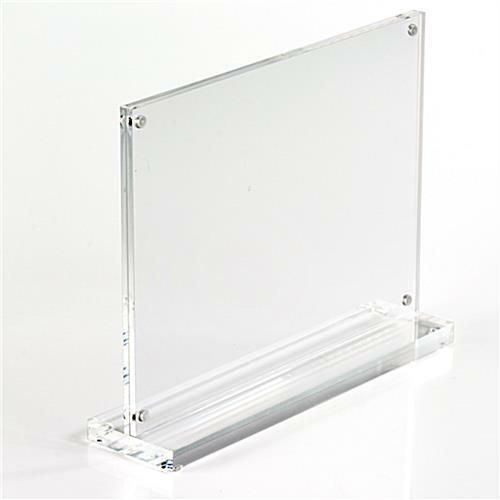 This photo holder, stand up picture frame is equipped with acrylic panels that are each 3mm thick. There are (4) small magnets that hold the acrylic sides together. 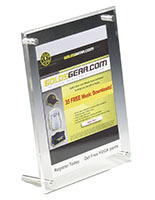 This stand up picture frame, also known as a photograph holder, is a great marketing tool for any retail establishment. 8.3" x 6.3" x 20.0"
8.9" x 0.5" x 2.0"
Very high quality. This is my second time ordering some of these. Will order more if I need them. Purchased magnetic acrylic frames and received 1 that was not manufactured correctly. The bottom did not have an indent for the frame to sit in and it was not glued to the bottom. I was forced to purchase more frames and as I need them soon I had to pay $25 shipping. Not received and hoping to receive money back for additional frame I had to purchase. Hi Laura, We're so sorry to hear you're unhappy with your experience with us. One of our customer care specialists will reach out to assist shortly. Thank you for your patience! We now have just under 100 of these around our office and they look great. Many compliments on them and are getting noticed right away. This signs have a solid base and are perfect to create quick marketing internal or external.